Suppose you had an offer from Airbnb a few years ago when it was worth $10 billion. If Airbnb ends up at its current valuation of ~$30 billion (I think it could be worth much more) then the $100 million offer may turn into $300 million or so at exit as Airbnb itself has grown 3X (ignoring dilution). If instead of selling to Airbnb, you kept going as an independent company and needed to raise money, you would experience further dilution. For example if you still needed to raise a series A, B, and C and issue more options to employees, you may dilute another 30-50%. Assuming that you will dilute on the low end of this (e.g. 25%) you will have needed to exit on your own for $400 million later to achieve the equivalent of the $100 million exit to Airbnb in the past (3X multiple, and then 25% dilution). If you experience 50% dilution then the Airbnb offer was worth $600 million. 3. Risk adjusted time value. One key element is timeline and risk. The average M&A exit takes ~6 years from founding. During that time a lot can change in the industry. In parallel a Stripe or Airbnb has a dominant enough position that momentum will continue to carry them forward and likely increase valuation. This means that on a risk adjusted basis exiting to a breakout company is, for high dollar acquisition offers, the right thing to do. For a lower value offer (e.g. $5 million exit) depending on your financial situation it may make sense to keep going unless you are running out of money or energy. The decision in part depends on where the acquirer's own valuation is likely to go. For example, when we sold my last startup MixerLabs to Twitter we assumed the company had a 5-10X in upside as a minimum (it is now almost 20X more valuable). The financial downside of an acquisition offers may lie in vesting. If you leave the company that buys you before you fully vest, you may lose much of the value of the acquisition. When thinking through the value of a purchase, you should consider whether the acquirer would truly be a long term home for you. Selling your company is not a purely financial decision. Impact your product could have on the world, the joy of building your own company (or selling and learning from others), who you get to work with, and other factors all matter. However, the purpose of this post is the financial aspects. Many founders fail to consider that the lower your valuation, the easier it is to sell your company. M&A offers tend to fall into a set of ranges. The higher the range, the harder it is to exit and the fewer companies can afford you. <$20M. Companies with $1 billion or more can make a fast decision to buy others in this range. <$100M. Companies worth $5 billion or more can make a fast decision in this range. At less then $1 billion in valuation $50 million to $100 million equates to 10% of a company and is a major buy requiring a lot of agonizing and board discussion. $100M to $250M. OK for a $10 billion company but will take real discussion and back and forth. Only will happen if truly existential or strategic for a $1 billion company. $250 to $500M. At this point only companies worth $5 billion or more can even consider it, and you will generally need valuations above $10 billion in many cases to pull it off. This will require real debate. For a Google or Facebook scale company, some of these buys can still happen quickly as it is small as a proportion of market cap. $1B+. Acquisitions of this size are very rare and generally requires extensive discussion and few buyers can get there. In general you need to be worth tens of billions to buy a company worth a billions plus, and you must hold strategic value to the acquirer. Since exits of this size are broadly reported on they seem common. In reality billion dollar startup acquisitions are rare. Example exits. Instagram versus Friendster. Both Instagram and Friendster were companies that had early acquisition offers. Friendster famously turned down a $30 million offer from Google in 2003 (probably worth billions today) and then eventually sold for $26 million in 2009 after raising tens of millions of dollars. While not selling Friendster at the time was the right decision given its traction, in hindsight enormous upside was lost for the founders. In contrast, Instagram sold to Facebook in 2012 for $1 billion. With Facebook's appreciation this is now many billions of dollars. However Instagram would probably be worth tens of billions today as a stand alone. One could argue Instagram sold too early, although the founders and investors obviously did well. What Is Your Startup Acquisition Really Worth? Startups tend to succeed by building a product that is so compelling and differentiated that it causes large number of customers to adopt it over an incumbent. This large customer base becomes a major asset for the company going forward. Products can be cross sold to these customers, and the company's share of time or wallet can expand. Since focusing on product is what caused initial success, founders of breakout companies often think product development is their primary competency and asset. In reality, the distribution channel and customer base derived from their first product is now one of the biggest go-forward advantages and differentiators the company has. This pattern of distribution as moat and competitive advantage was used ruthlessly by the prior generation of technology companies. Microsoft bought or built multiple franchises including Office (Word, Powerpoint, Excel were all stand alone companies or market segments), Internet Explorer, and other products and then pushed them down common business and consumer channels. Cisco has purchased dozens of companies that were then repositioned or resold to their enterprise and telecom channels. SAP and Oracle have exhibited similar patterns of success. Of the most recent crop of technology giants, Facebook and Google realized the power and importance of distribution early in their respective lives. While Google's reputation is that of organic growth, in reality the company bought placement on the Firefox homepage, as well as paid hundreds of millions of dollars per year to have Google search toolbars distributed via download with other applications. Google then used its search customer base to bootstrap other products and distribute Maps (Where2 acquisition), Gmail, Chrome, Docs (Writely and other acquisitions), and other products. Similarly, Facebook invested heavily in growth efforts and acquired multiple companies for email scraping (Octazen), low end feature phone distribution (Snaptu acquisition) and other approaches. It then used this distribution to help accelerate acquisitions like Instagram to the global market. 1. Build a product so good that customers will use you over an incumbent. Build a large userbase on the back of this first product. 2. Be aggressive versus complacent about customer growth early. Outsized companies like Google, Facebook, and Uber were aggressive and calculated about growth from their earliest days. In contrast non-metric driven, less aggressive companies failed to reach the next level of success. Too many companies get complacent about distribution if their core product "just works". 3. Realize your customer channels are a primary asset of the company. Build new products or buy companies and push them down your sales channel. Uber has been trying to do this more recently with Uber Eats and its Jump acquisition. 4. Realize that your company will not be able to build everything itself. Buy more companies and push them down the channel. Most companies need to overcome internal resistance to buying companies. A common set of arguments are made about how easy it would be to build something in house instead, or integration challenges will be too hard. In reality, breakout companies never have enough resources to do everything and should buy more startups. The smartest companies realize they are also in the distribution business, and will buy (or build) and then redistribute a range of products. When I was at Google, it grew 10X from 1500 or 2000 people when I joined to 15,000+ people when I left 3.5 years later. My startup MixerLabs was acquired when Twitter was ~90 people, and I left Twitter 2.5 years later at 1000+ employees. 90% of the people at Twitter had not been with the company just 2.5 years earlier, and Google added 13,000 people in a little over 3 years. If your company is in hypergrowth, you will be doubling the team every 6-12 months on average. At that pace you could go from 20 to ~300 people in 2 years and to 500 or 1000 people in 4 years. You will be adding new functions rapidly (finance, HR, legal), potentially expanding internationally, while product roadmaps will expand and new areas will be launched or acquired into the company. You will effectively be working at or running a different company every 6-12 months, with most of the people at the company having joined in the last 12 months. As the company scales and increase in complexity you will also need to change the organizational structure of the company to reflect new executives, new functions, more employees, and changing alignment against your market and product. In other words, re-orgs will occur at the company frequently. Early on many of the reorgs will be at the executive level and then cascade down. As you add more functional areas, there will be finer division of executive roles. If you add a CMO or other CX-level person then some of the executive roles may consolidate under that individual. Once you hit 500 to 1000 people, you should expect fewer company level re-orgs and many more interfunctional re-orgs. For example a change within the structure of the sales team, versus changes across all teams simultaneously. Some teams such as sales are more likely to re-org frequently at that point as they scale, while others like product and engineering tend to be more stable. Part of this has to do with where head count grows and needs change most rapidly in a company as it switches from being solely product-centric, to focusing more on go to market. 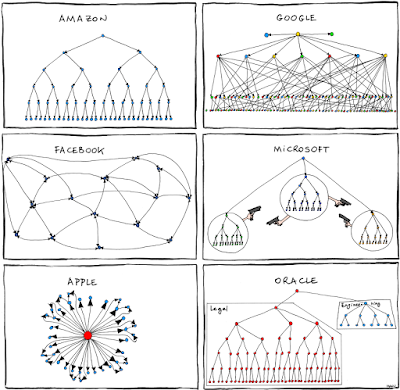 The biggest cross-company re-orgs later as the company scales will occur when changing product/engineering/go-to-market simultaneously, adding new product areas or acquisitions, if a company flips from a matrix to business unit-like organization, or flips between centralized and decentralized internationalization. Early on, you as CEO will need to be adept at re-orgs. Later as re-orgs shift more frequently to functional organization, you will need to make sure your leadership team knows how to approach them. Most companies and new managers screw up their first re-org or two, causing unnecessary pain in the organization. Below is a simple guide to re-orgs. 1. Decide why you need the new org structure. Determine what the right structure is and the logic for why this is better then before. Do you need renewed focus on a specific area? Are there collaboration issues? Has the team grown dramatically and now needs additional management? Has something changed in your market that means you need to re-align functional priorities or the set of people working together? Spell out to yourself the logic of why you need to re-org first, and then think through the leadership and org structure that works best. 2. 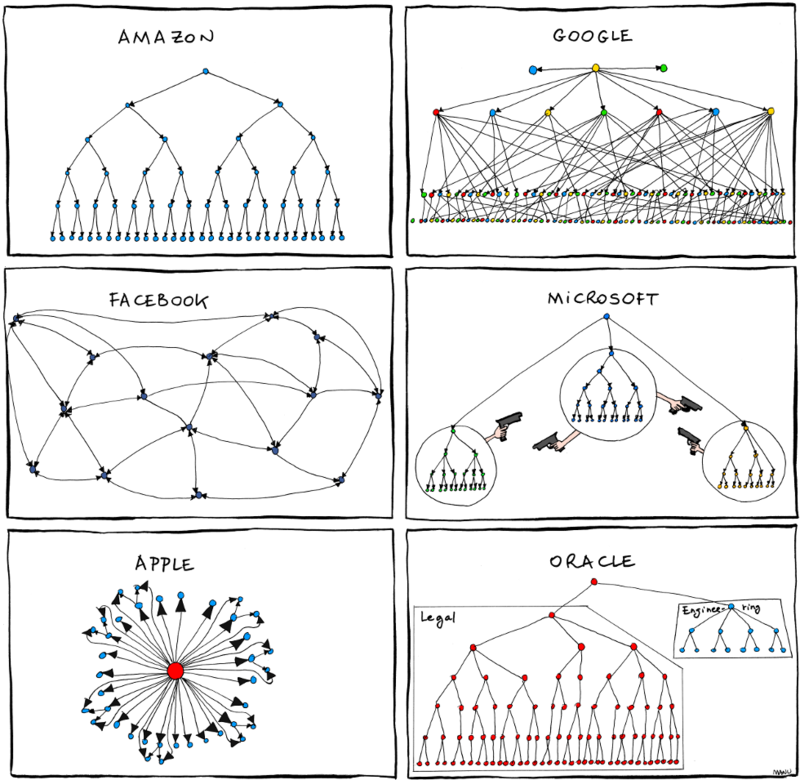 Org structure is an exercise in pragmatism. Who on your leadership team is overloaded and who has bandwidth? Who is building out a great management layer? What areas would fit well together? Sometimes, there is no single right answer, and you need to balance managerial bandwidth with the logic of the situation. As you determine who needs to work on what, and the proper reporting structure, remember that nothing you come up with will be 100% perfect and that is OK.
Should you have cross functional product and eng organizations or verticalized product units? Should international be distributed or centralized? These sorts of questions come up all the time as companies grow, and some companies flop between structures over time (Oracle supposedly flips its international org every few years). Relatedly, reporting is an exercise in tie breaking - i.e. you want people who are likely to disagree to eventually report in to a single tie breaker (this may be the CEO, or it may be someone lower down in the org). 3. Get buy in from the right people before implementation. If possible, you should consult with a handful of executives whose functions would be most impacted by the change. They may have good feedback about how e.g. changing the org in your function impacts their own functional area (e.g. changing the org structure for product may impact how engineering and design are structured). Re-orgs should never be open conversations with the whole company (or a functional area) about what form the new organization structure should take. This only opens you up to lobbying, internal politicking, and land grabbing. It also prolongs the angst - re-orgs should happen swiftly and with as little churn as possible. 4. Announce and implement the re-org soup to nuts in 24 hours. Once you have decided what form the new organization will take, discuss it with your reports in their 1:1s. Your executives should have a clear plan for how and when to communicate the changes to their team members. If there are key people deeply affected or likely to be unhappy with the change, you or one of your reports can meet with them either right before or right after the announcement to hear them out and re-affirm the logic for the changes. You should never drag out a re-org or pre-announce it. E.g. don't announce "this week we will re-organize product, and next month we will change engineering". If possible, all elements of the re-org need to be communicated and implemented simultaneously. If you pre-announce a portion of the re-org, that team will not get any work done until the re-org happens. Instead, there will be hushed conversations in conference rooms full of gossip and speculation, crazy rumor-mongering, and executive lobbying. 5. Every person on the leadership team should be briefed on the re-org and be ready to answer questions from their team about. If the re-org reaches or impacts enough of the company, the executives of the company should be briefed ahead of time. Write up an internal FAQ if needed and circulate it. 6. Remove ambiguity. Know where ~100% of people are going. Don't do a partial re-org. When the re-org is announced, you should know where ~100% of people are going if possible. The worst possible situation for people is to not know what their future entails. Make a list of the people most likely to be unhappy with the change and reach out to them quickly after the announcement, or speak to them before the change if necessary. Make sure to later be accessible to these people so you can explain the reasoning first hand. 7. Communicate directly and clearly, and compassionately. Don't beat around the bush when doing the re-org. Explain in clear language what is happening and why. Listen to people's feedback but be firm about the change. There will always be people who are unhappy with the shift in org structure. They may feel passed over for promotion or demoted, even if this is not the case. Listen carefully and see if you can meet their needs in the future. However, keep backtracking to a minimum. You are making this change for a reason, and if you start making exceptions to the squeekiest wheels you may reverse the whole reason you are making the change, as well as show people you are open to being politicked. Just like letting people go, a re-organization can be unpleasant. There will undoubtedly be people disappointed by their new role or diminished responsibilities. If done right however, your company will function more effectively and be aligned to win. Re-orgs have to occur for the long term success of the company.